"From time to time Kate entertained the notion of looking for work elsewhere, but it never came to anything. She didn't interview well, to be honest. And anyhow, she couldn't think what she might be qualified to do instead. In her coed dorm back in college she had once been drawn into a game of chess in the common room. Kate was not very good at chess, but she was an audacious player, reckless and unorthodox, and she managed to keep her opponent on the defensive for some time. A small crow of her dorm mates gathered around the board to watch, but Kate paid them no attention until she overheard what the boy behind her whispered to someone standing next to him. 'She has. No. Plan,' he whispered. Which was true, in fact. And she lost the game shortly thereafter. She thought of that remark often now, walking to school every morning. Helping children out of their boots, scraping Play-Doh from under their nails, plastering Band-Aids onto their knees. Helping them back into their boots. 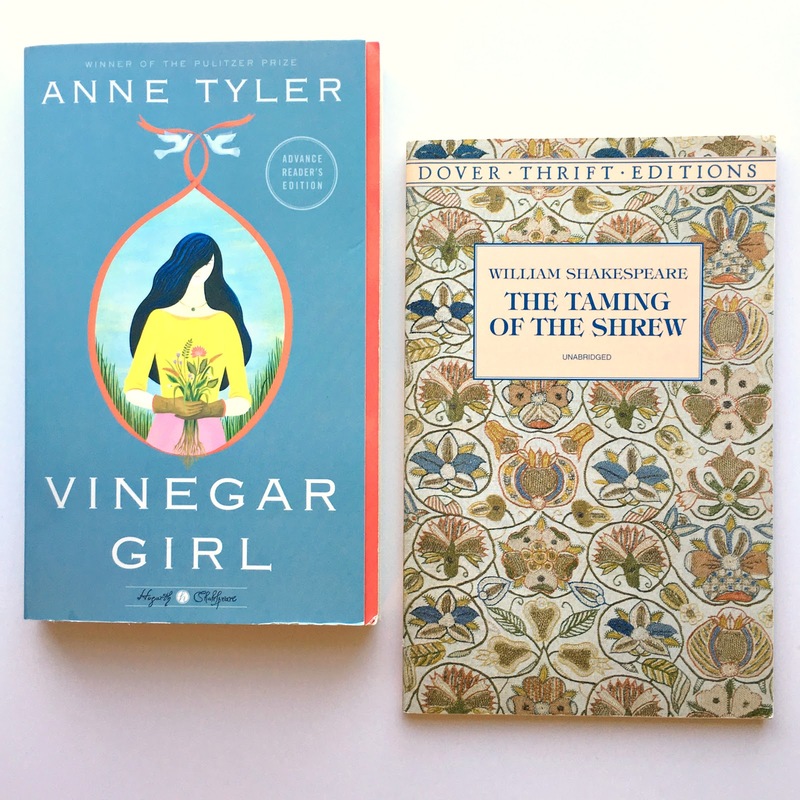 In Vinegar Girl, Pulitzer-Prize winner and best-seller Anne Tyler retells Shakespeare's The Taming of the Shrew for a modern audience. Published by the Hogarth Shakespeare series, the book is a part of Penguin's movement to update the author's most famous plays. I eagerly looked forward to reading Tyler's remake in large part due to the fact that it is my least favorite of Shakespeare's plays. Worse yet, it's not a favorite; I don't like it at all. If you've never read or seen The Taming of the Shrew (watching the film 10 Things I Hate About You doesn't count here), you're not missing out on much. Though I've read almost all of Shakespeare's plays, many of his sonnets, visited his home in England, and adore his writing, this particular play always leaves me feeling ill inside. The play (categorized within Shakespeare's comedies) tells the story of two sisters: the beautiful if young and ignorant Bianca, and her older, stubborn "shrew" of a sister Katherina. While many men want to court Bianca, patriarchal tradition holds that Katherina must be married off first. As a dare, Petruchio decides to "tame" the shrew through various methods of psychological, emotional, and physical abuse. To Elizabethan male audiences this would have been comical. To modern-day audiences, it's nothing short of disturbing. While Shakespeare's verse is well-crafted and metered, the content is upsetting. My review of the play on my Goodreads account reads as follows: "Sexism in iambic pentameter." I set out with high hopes for Tyler's story, wanting to see how she would update a misogynistic play and turn it into a story of modern-day empowerment. I was disappointed. The back-cover summary of Vinegar Girl describes its main protagonist, Kate, as "a thoroughly modern, independent woman" and questions if she "would ever sacrifice herself for a man." The novel, however, doesn't give us an independent woman: Kate is lazy, bored, unhappy, dependent on the safety of her father's home, and unwilling to change anything about her life to improve her situation. A college drop-out, Kate works at a child daycare center not because she loves (or even likes) children, but because it was the only place she could get a job. She cooks the same thing every night for dinner, pulls the same weeds from her garden once a week, walks the same way to work, and is in general completely dull on every level. She lacks wit, drive, compassion, and any interest to the reader. Her younger sister, Bunny, is naive, rather stupid, and whiny. Their father is selfish, ignorant, and emotionally distant. This all sounds rather harsh, but it's true nonetheless. Kate's father, a rather unsuccessful college scientist, is on the verge of losing his lab partner, Pyotr, and consequently any hopes of proving his worth to the university (whether or not his research actually holds any merit remains unclear). Before Pyotr's work visa runs out and he's sent home to Russia, Kate's dad asks his eldest daughter to do him a favor and marry Pyotr. Healthy family dynamic, right? [Spoiler paragraph] What's worse than reading about a boring, unhappy character who's complicit in her own boredom and unhappiness, is Kate's completely passive, disinterested attitude as the plot proceeds. She feigns anger at her father's request, but her actions say otherwise, and ultimately she agrees. She doesn't like Pyotr, but marries him. 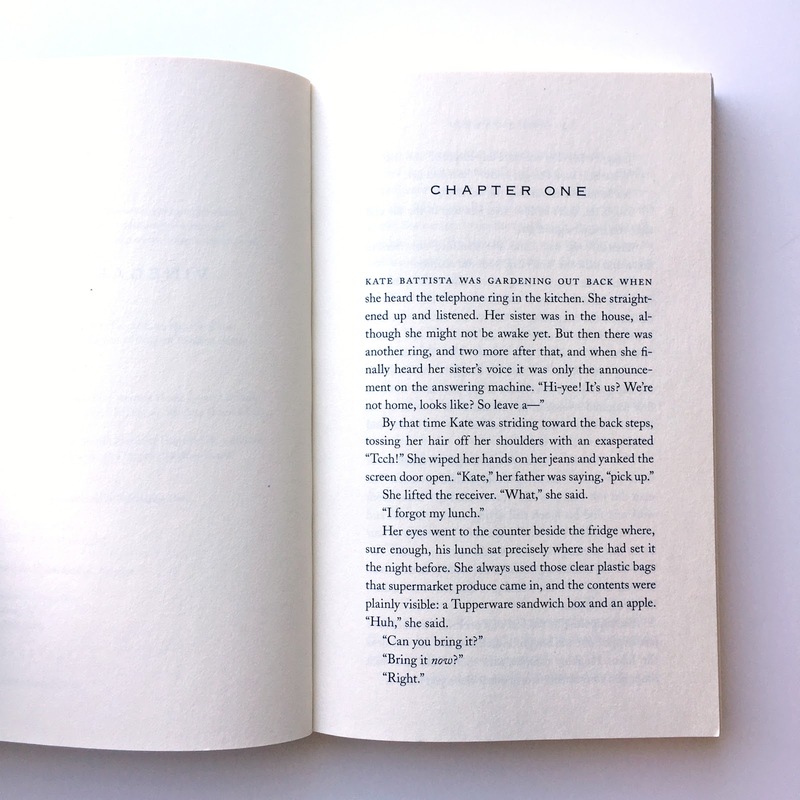 Though she's never been happy and there's no evidence that she's happy now, the author wraps up the novel in a cute bow as if this were a teenage rom-com and the two live happily ever after. While some might argue that change could foster Kate's happiness, are the accompanying suggestions about mental health really the moral messages the author wants to convey? That depression is a quick fix? That women are chattel? That relationships don't require work? No evidence within the story suggests Kate's happy ending is plausible, healthy, romantic, or well written. The entire book's execution left me confused, frustrated, and annoyed. I was hoping for a rewrite and instead ended up with a story as messy as the first. Ultimately, readers get the tale of a woman who repeatedly demeans herself and submits to abusive, controlling men in order to sacrifice the possibility of her own happiness, freedom, and agency for their convenience. The message remains destructive. I did think that the first third of the story had promise, but then the novel ultimately crashed and burned. While I really appreciate Hogarth Shakespeare's mission to retell Shakespeare's plays, I wonder if in reaching out to Tyler and asking if she'd be interesting in rewriting The Taming of the Shrew, if she wasn't also given a sort of editorial cart blanche. The published novel feels more like an early concept than a well thought-out and polished interpretation. Not having read anything else by Tyler and hearing mixed reviews from friends about her most recent novel A Spool of Blue Thread, I'm wary to tread her authorial waters again. 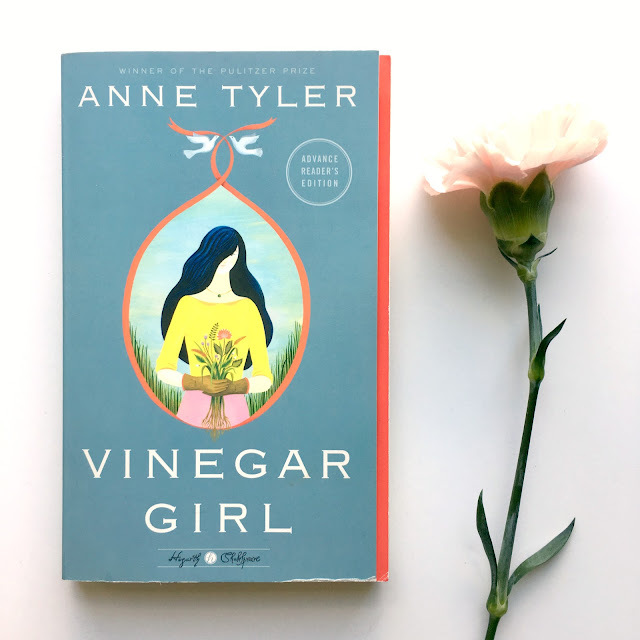 If you've read Vinegar Girl, I'd love to hear your thoughts. Have you read an Anne Tyler novel? Have you read The Gap of Time by Jeanette Winterson or Shylock is My Name by Howard Jacobson, the other two volumes in the Hogarth Series? Their next installment is titled Hag-Seed, a retelling of The Tempest by none other than Margaret Atwood, is due out this October. As a huge Atwood fan, I'm hopeful she will do well with her adaptation.